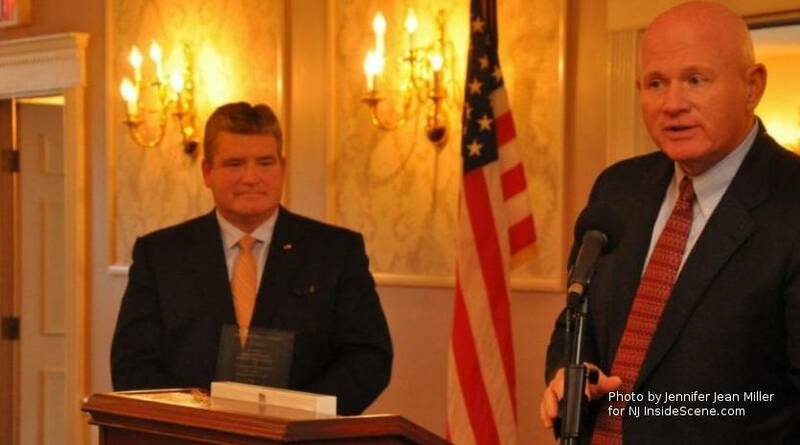 New Jersey Legislative District 24 Senator Steve Oroho (left) accepts the Distinctive Leadership Award for his colleague, Alison Littell McHose, who was unable to attend the event. Chuck Roberts from Ames Rubber (right) was the presenter. Tammie Horsfield President of the Sussex County Chamber of Commerce, and Economic Development Partnership, presents a special award to John Drake, for his advocacy to area businesses. 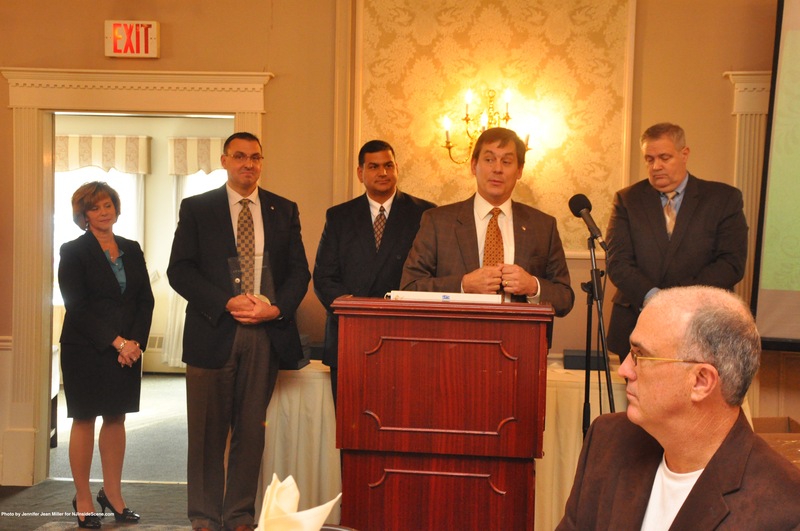 LAFAYETTE – Business owners, individuals and their supporters gathered on Friday, Nov. 22, for the ninth Annual Sussex County Economic Development Partnership (SCEDP) Luncheon, held at the Lafayette House. Woven throughout the luncheon, were the various award categories. Event sponsors were Laddey, Clark & Ryan, LLP, and St. Clare’s Health System. The event’s cornerstone award, the Distinctive Leadership Award, was given to New Jersey Assemblywoman Alison Littell McHose (R-24). The Distinctive Leadership Award is given to an individual or entity that has made “an extraordinary contribution to Economic Development.” Other nominees in addition to McHose were: John Eskilson, Tony Labozzetta, and Ray Nisovoccia. McHose was returning from a conference for the National Foundation of Women Legislators, and was unable to be at the luncheon. New Jersey Senator Steve Oroho (R-24) accepted the award on her behalf. “It is very rewarding to get the recognition from those you serve everyday,” said Oroho of the honor. 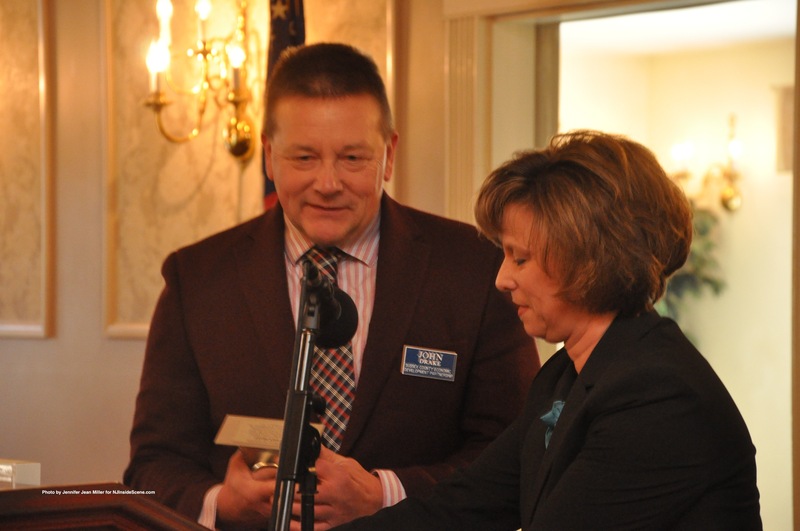 Sussex County Chamber of Commerce and SCEDP President, Tammie Horsfield, presented a special award to John Drake, the Director of Client Services from the SCEDP, his service to the group. Horsfield explained that Drake is not compensated for his role, which is a volunteer position, and goes the extra mile to help local businesses flourish. “An entrepreneur himself, John Drake is a leader, a friend, a wonderful hardworking volunteer, who really understands what it takes to expand or retain a business here in our county,” Horsfield said. The first award category was the New Business Award. The award is reserved for a business that has started in or relocated to the county, within the last three years. This year’s nominees were: AVE Care at Newton Inc., C3 Workplace, Chuckle Time, Digiplex Sparta Theatre, Down to the Bone Barbeque, Extreme Pizza of Wantage, Forno Italiano, It Works!, NJ Inside Scene.com, Pet Smart, Safely Back Home, SAVOUR Café, Schenck, Price, Smith & King, and St. Moritz Grill and Bar. This category brought about two winners this year: St. Moritz Grill & Bar, and Schenck, Price, Smith & King. The second category was the Business Expansion Award. Urgent Care at Vernon, CP Engineers & Architecture, Hayek’s Market, High Point Solutions, Lakeland Bank, McGuire Chevrolet, and Sussex Bank, were among the nominees. This year, McGuire Chevrolet, which just relocated to a new dealership facility from Hampton to Newton, was the first, and CP Engineers & Architecture, the second. CP Engineers & Architecture Managing Members from left to right Ray Roggero, Joe Toscano, and Stan Puszcz, flanked by Sussex County Chamber of Commerce and Economic Development Partnership President, Tammie Horsfield (left) and presenter Glenn Gavan (right). The third category was the Business Advocacy Award, for organizations or individuals that support local business through consultation and more. The nominees were: C3 Workplace, First Hope Bank, Highlands State Bank, Lakeland Bank, LeTip of Sparta, Lisa Fairclough, Rob Nicholson, PSE&G, Gail Phoebus, Sussex Bank, and USDA Rural Development. The winners in this category were: C3 Workplace and Lisa Fairclough. The next category was the Municipal Award, for which nominees are municipalities that exhibit business friendly qualities and provide business attraction and retention incentives. The Boroughs of Branchville and Hamburg, and the Townships of Frankford and Hardyston, were among the nominees. Tom Walsh of the Andover Township Committee and this year’s current mayor for the township, was also a nominee. Hardyston Township took the municipal award. This past year, Hardyston’s Mayor Leslie Hamilton, was chosen at Mayor of the Year, in an earlier ceremony by the SCEDP (click here for our previous story). There were several nominees for the Business Investment Award, which is an award for “an individual or entity that generously and substantially contributes financial resources to support a business or business and/or workforce, and they include: Atlantic Health system, Crystal Springs Resort, Eastern Propane Corporation, Hayek’s Market, Lakeland Bank, Sparta Redi Mix, Saint Clare’s Health System, Sutherland Packaging, Inc., and Thorlabs. The winner this year was Atlantic Health System. The Economic Innovation Award is for “a business or entity that has successfully created new and innovative solutions to support economic development efforts.” Dale’s Market, KG Companies, the Town of Newton, and County of Sussex – GIS, were the nominees. This year two winners each took away an award – the County of Sussex – GIS, and Dale’s Market. Training & Workforce Development was the next category, with ADP, C3 Workplace, Project Self-Sufficiency, Sussex County Community College, and Sussex County Technical School as the nominees. Project Self-Sufficiency took away the award on Friday, for filling the criteria through its innovative training programs to help further develop Sussex County’s workforce. The Environmental Leadership Award denotes a person or entity that helps to develop or expand a business that complements Sussex County’s character and environmental priorities. Ames Rubber Corporation, Hidden Pastures, Hopatcong Farmers Market, Peter Kellogg, John Maione, Steve Oroho, Nathaniel Sajdak – Wallkill River Watershed, and Sparta Farmers Market were nominated. Hidden Pastures, a Sussex County Alpaca farm, was chosen. During the event at 1:30 p.m., Horsfield asked attendees to observe a moment of silence in memory of U.S. President John F. Kennedy, the exact time 50 years ago, when he was assassinated. “He left a big footprint here,” Horsfield said. Editor’s Note: NJInsideScene.com was proud to have been nominated for the New Business Award and give our special thanks to whomever nominated us. We congratulate all of this year’s winners. 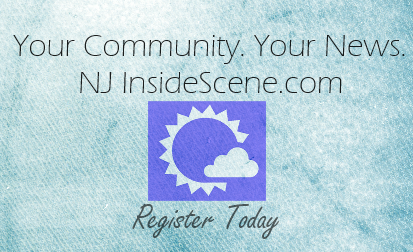 Follow NJInsideScene.com on Facebook for the “inside scene” on stories around our area.